Financial markets can change in the blink of an eye. But, with the advisors at Gotleib and Associates, LLC, you can rest assured that your personalized wealth management strategy will be ready to adapt at subatomic speeds. Gotleib & Associates, LLC is committed to providing superior service to our clientele. Each and every client is important to our success and deserves individualized attention. 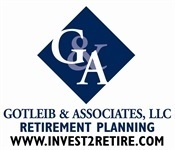 We offer our services to potential retirees in a professional manner and will never compromise our integrity.